Here is where the Shiloh commission painting stands now. I will be working on it further this weekend. 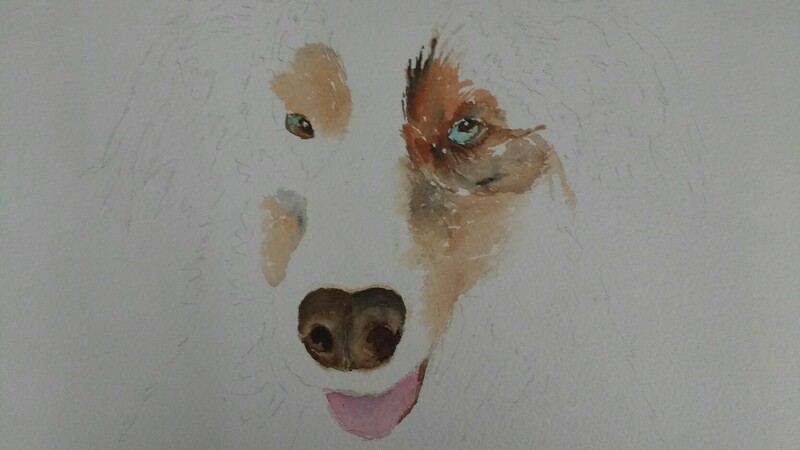 Once the area around his right eye has more done, I think it will be well along. Here’s the board I have handy to work from. The top photo is the principal one, the black and white next to it shows me the values. The bottom right photo shows his ears, the dreadlocks, that I am incorporating. 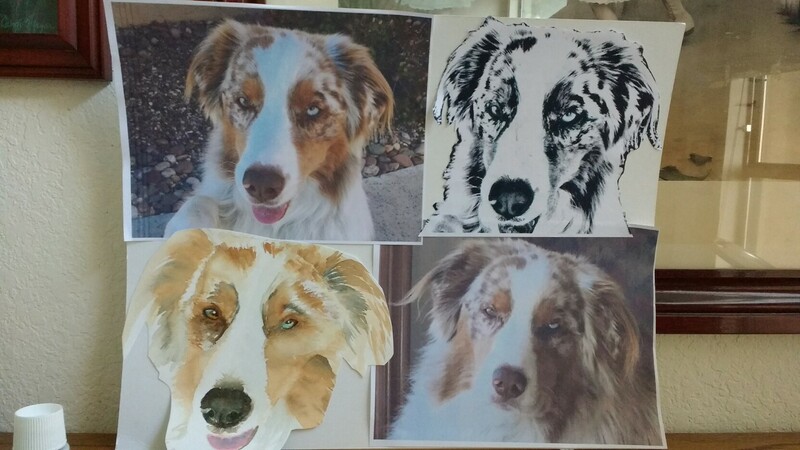 And the bottom left is the initial practice painting. 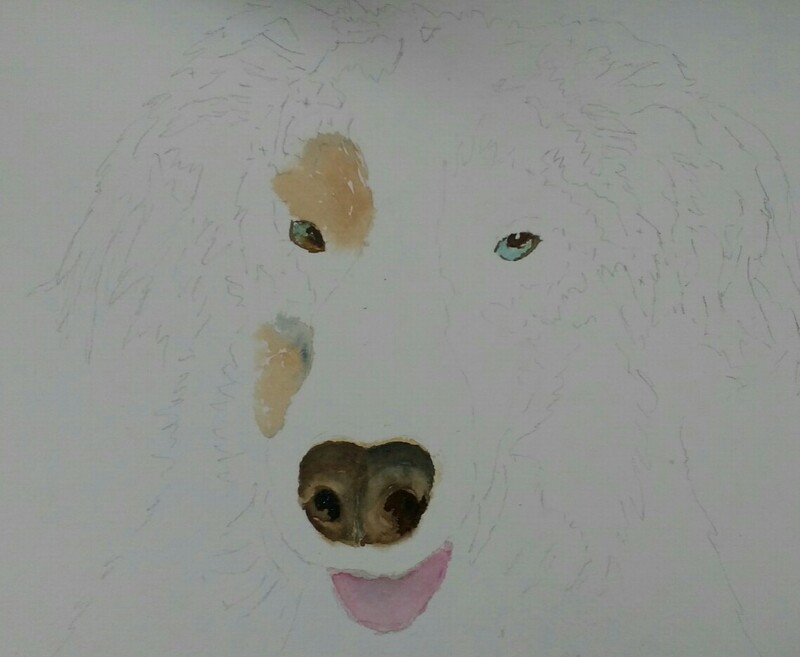 I got lost in keeping some of the white areas of his fur, and with watercolor keeping the white paper is imperative. 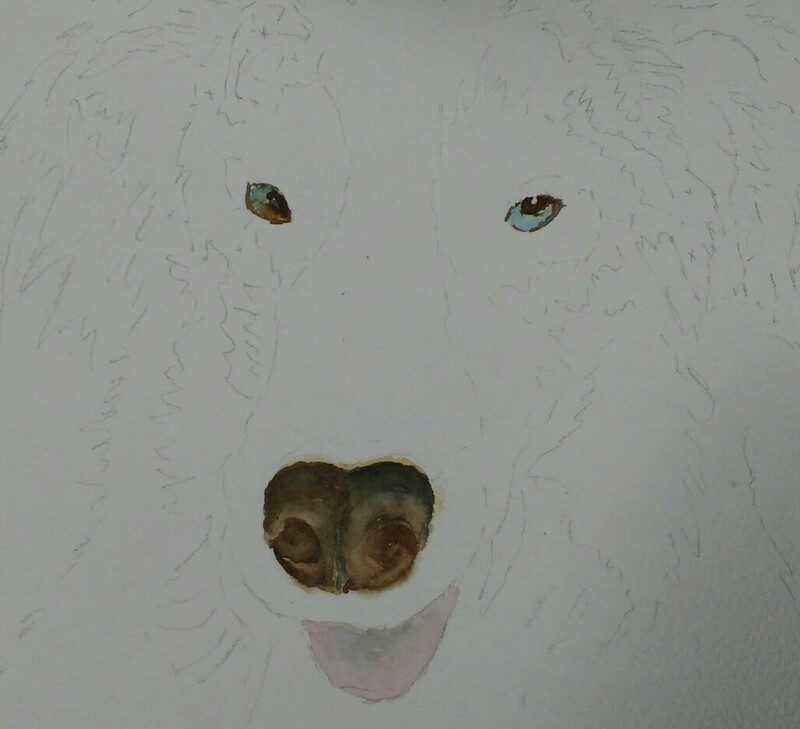 So on the current painting I have a tiny white x in each area to remind me to keep them white. Here are earlier stages of the painting. The Distance. 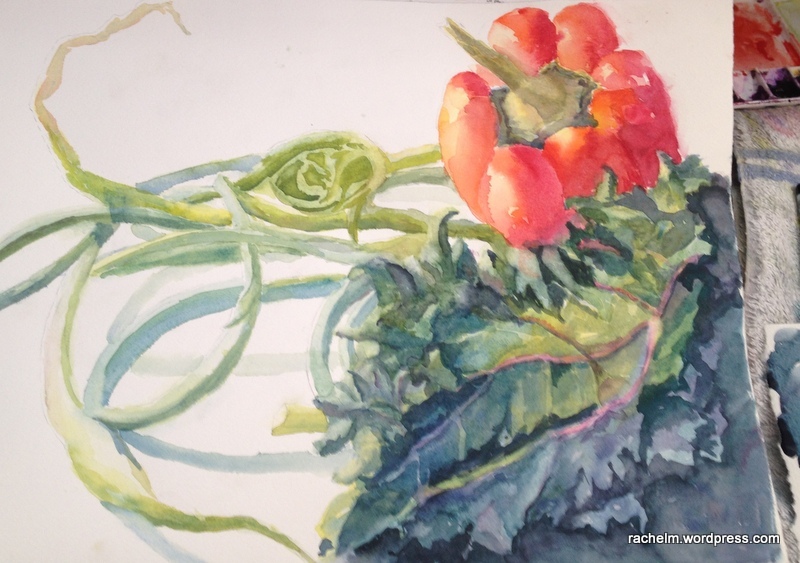 Watercolor by Rachel Murphree, framed to 11″ x 14″. $125. I am pleased to announce that I have two pieces juried into the “For the Love of Art” show in Las Cruces at MAS Art, 126 South Main Street, Las Cruces, NM 88001. The show opening is February 5th from 5-7 pm. If you are local, it would be great to see you there! The Distance was actually done during the 30 paintings in 30 days challenge I did in September. You can read about the process from my blog post at that time. 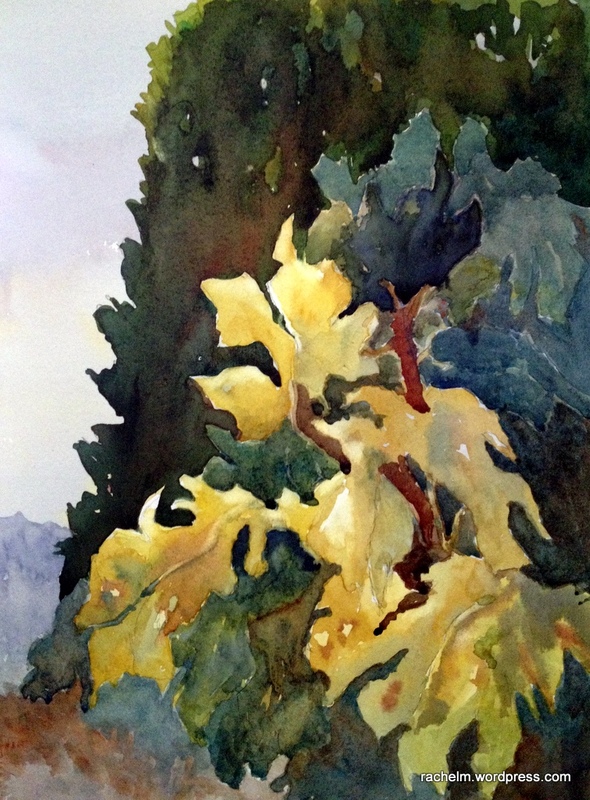 Agave Shadows #1, done mostly dry on wet. Framed to 12″ x 16″ $125. 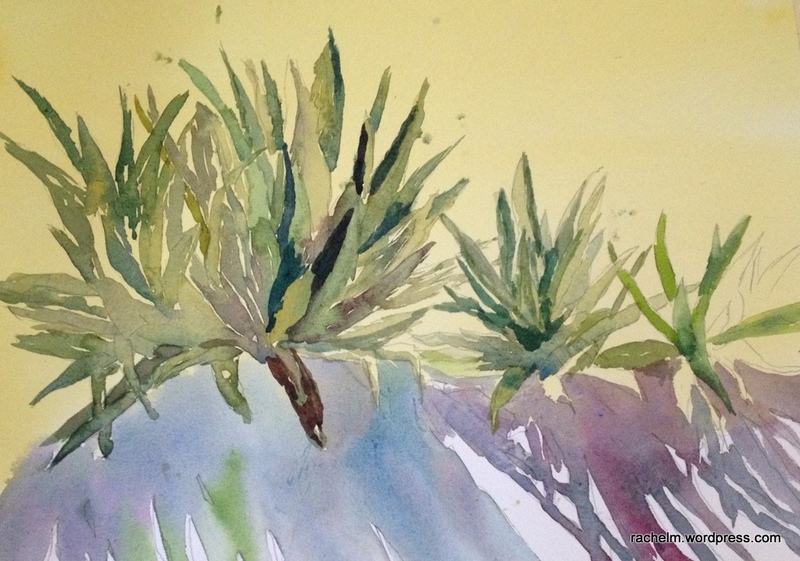 The other is Agave Shadows #1 which I did earlier last year. You can read about the process at this post. And here is the painted value sketch amended from yesterday. I realized that I didn’t have the value of the foreground prickly pear dark enough, so I added another layer of color. You can’t always judge the value of items from a photograph, but I think in this case the dark value of the front is appropriate because it is in shade, and it reinforces the brightness of the sunlit area by the wall. I think it works better. What do you think? 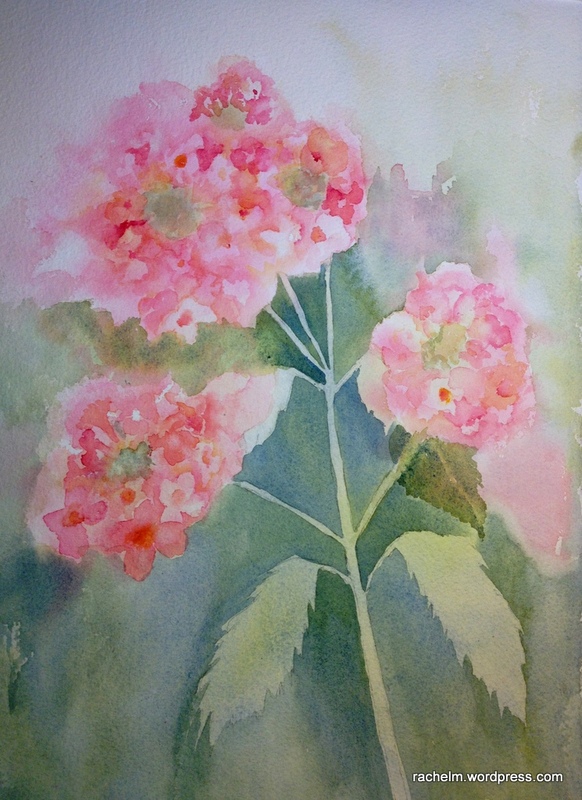 I think tomorrow I will do a value sketch with using just one pigment to focus on values and not play with the color. 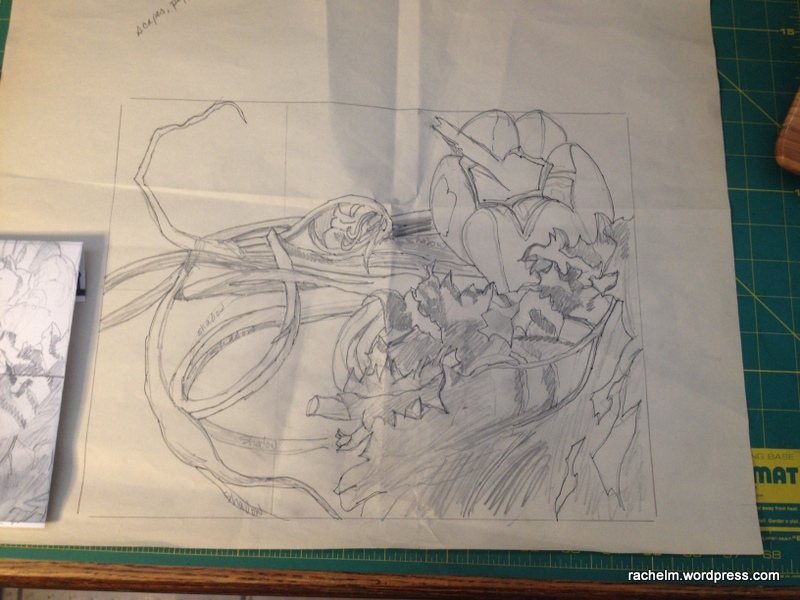 Here are some of my preliminary sketches, more detailed than I expect a lot of more experienced painters would do, but it helped me to fully understand what I was seeing, how the leaves and the shadows looked. 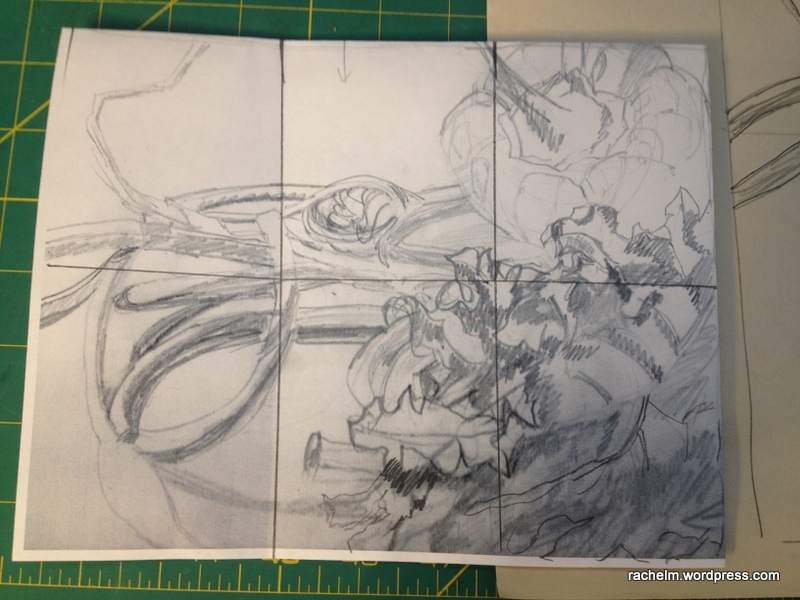 It was interesting to see that the larger sketch reinforced the thumbnail value sketch I made previously. It helped me to do a line sketch another day. So I felt that I “knew” the fig leaves and light and I had the painted value sketch hanging around on the easel over several days and I was still excited about translating it into a real painting. 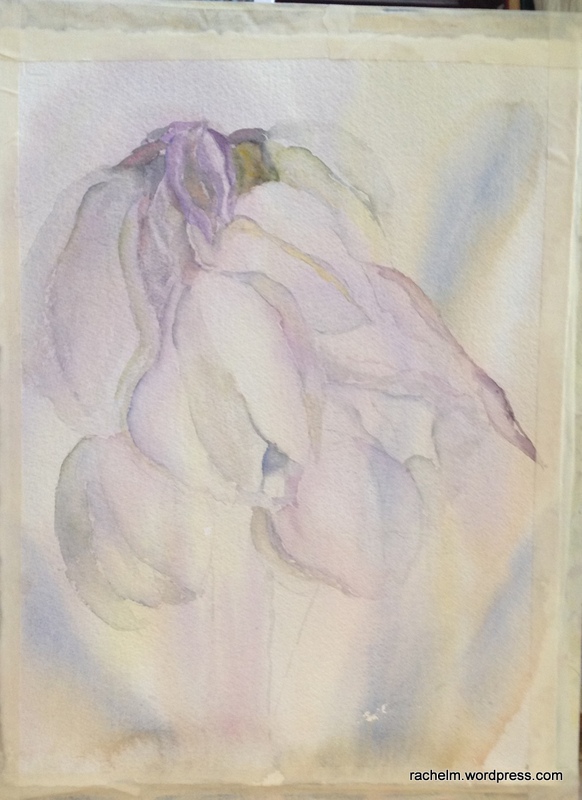 Step one was to put a light under-painting to define and isolate the whites and put down warms and cools in a very pale wash. As usual in this stage, I lost my place and left whites on different leaves than my original plan, sigh!, so I just adjusted my thoughts and went with the whites I was “given”. 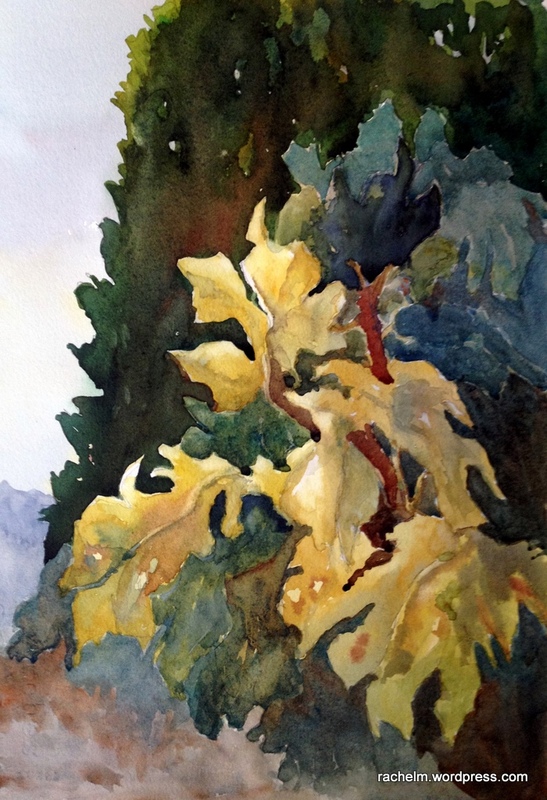 Once that wash dried, I put in the darks of the Italian cypress behind it because I knew that the effect of sunlight making jewels of select yellowing leaves relied on the dark values around them. Then I started putting in the next layer, trying to mix pigments on the paper rather than in the palette, keeping in mind that cooler colors receded so I used them in the leaves in the back and keeping focal leaves pale and warm. I also warmed up the leaves in bottom front. I deliberately left the foreground suggestive rather than detailed. But I am open to suggestions that it might need a bit more definition, or warmth? I really like it now because as I was bringing color down into the bottom and then just brushed it aside with a sweeping motion mixing colors at the same time, as I often see in professional painting videos. 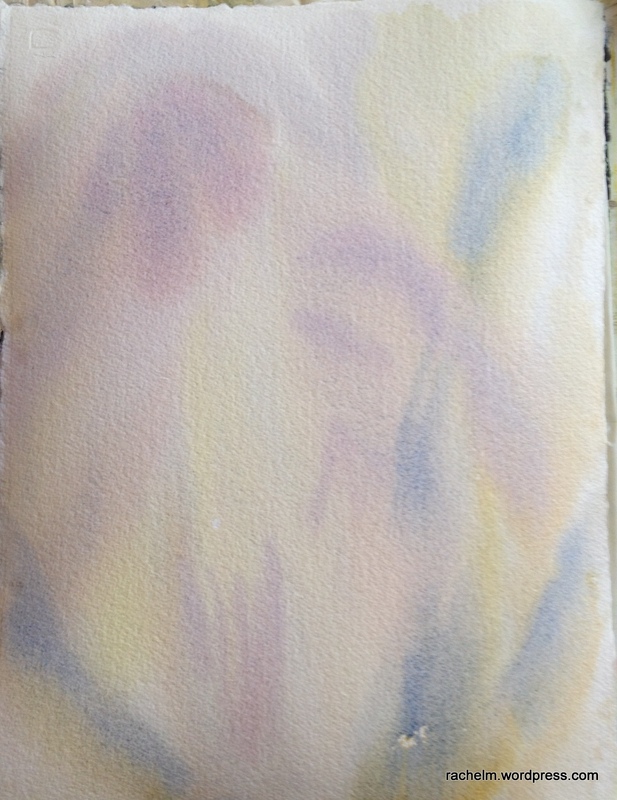 I thought I was finished before I really was, at the stage three photo, but my daughter suggested (and I saw it when she mentioned it) that she knew I was trying to have the yellows pop, but the values behind them weren’t dark enough…and sure enough, it didn’t match my value sketch. Once she’s left the house for college, I will have to figure these things out on my own! I’m sure with fresh eyes on another day, I would have seen it. If you squint at this stage three, you see that the a lot of the leaves all have the same value of darkness. I wasn’t crazy about adding more layers to those leaves because I would be losing some of the transparency, so in the future I have to practice, practice to get the values spot on the first time. It’s hard to do because paint dries lighter than when it’s wet, so it’s a matter of more painting and paying attention to that. So when I was deciding what dark value blue to use, I tried out indigo and indanthrone blue on a separate piece of paper, and noticed that indanthrone was warmer, so I chose that one to let the cooler cerulean chromium layered leaves at the very back look further away. So I would love to hear your comments and suggestions. Do you think the foreground, left corner, needs more? is there anything confusing that bothers you? I really appreciate your comments and suggestions and hearing from you! and blues using cobalt and ultramarine with new gamboge and aureolin yellow. I put some water in areas and painted up to those letting the color blend into the water. You can see that to the right of the largest cluster there’s a water blossom run that I’m happy I didn’t try to fix while wet….I’m finally realizing that doesn’t work! as it is, it looks like it can suggest leaf edges for the background. In the next image on the right you can see I’m painting over the light rose tones to separate the clusters from each other and put in the first background leaf. 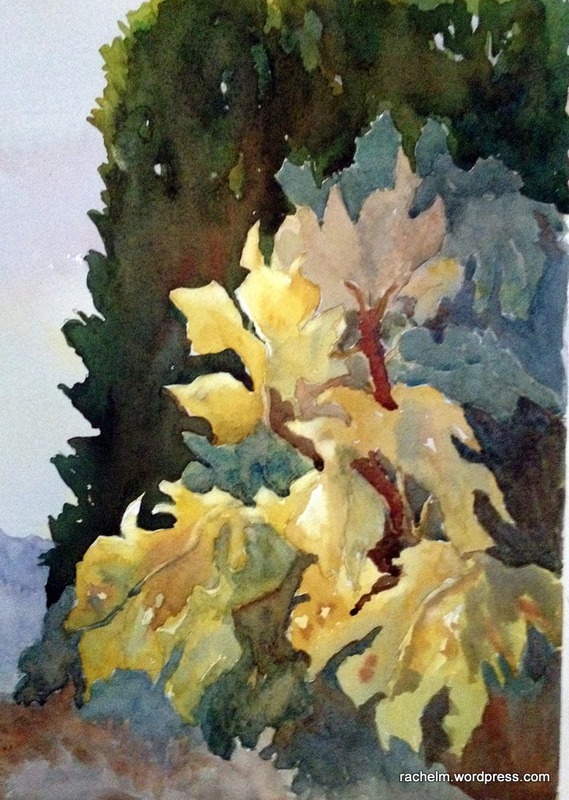 I’m leaving the primary leaves and stems in the light color for awhile and see what I like. I’m enjoying taking my time with this painting, as opposed to doing smaller pieces daily…they both have their merit, but I’m going to enjoy the change. I do intend on sketching daily and posting. 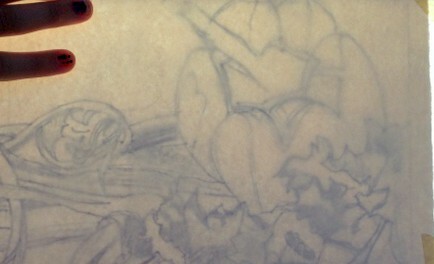 I had a drawing breakthrough in our painting group today, can’t wait to share that with you tomorrow! 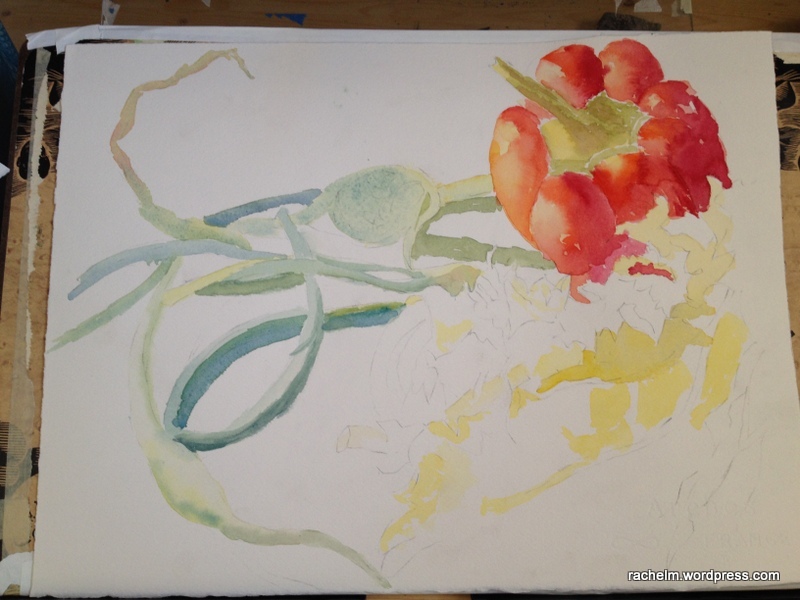 Scapes painting stage 4. Click on image to view larger. As you can see, if you compare with the last post, I’ve added some darks into the kale and made it so much more lively! The darks I used were a mix of thalo green blue shade and quinacridone magenta. This is a great dark combination that’s also transparent, and I plan on using it in the background along with charging into it some other colors used in the existing veggies to give it color harmony. And you can see it here, I’ve taken the plunge and started on the background. I think I’m going to be happy with it and you can see that the background is really broken up into sections which is nice. I can work on parts and soften the edge where they would join up so that there isn’t a hard line where they meet. you can see I did that to the left of the pepper stem. Here are some further photos of stages in the painting. 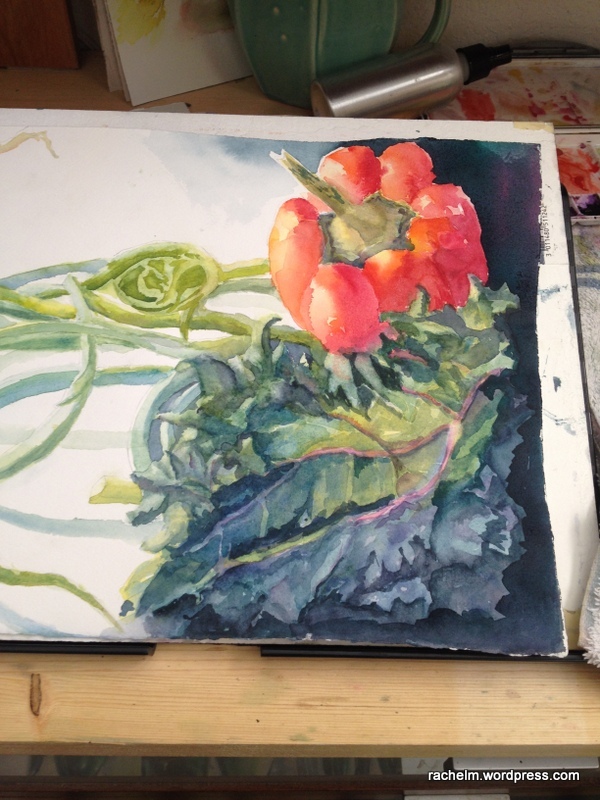 At this stage I hopedit could be ok, but I felt overwhelmed by I put down the colors of the kale but was getting lost in the curves, ruffles, and edges. After doing anything BUT painting on this — i.e. cleaning the baseboards, organizing closets, I think some of you will understand these impulses! — I realized I need to look at each section and develop it in an attempt to not get lost. 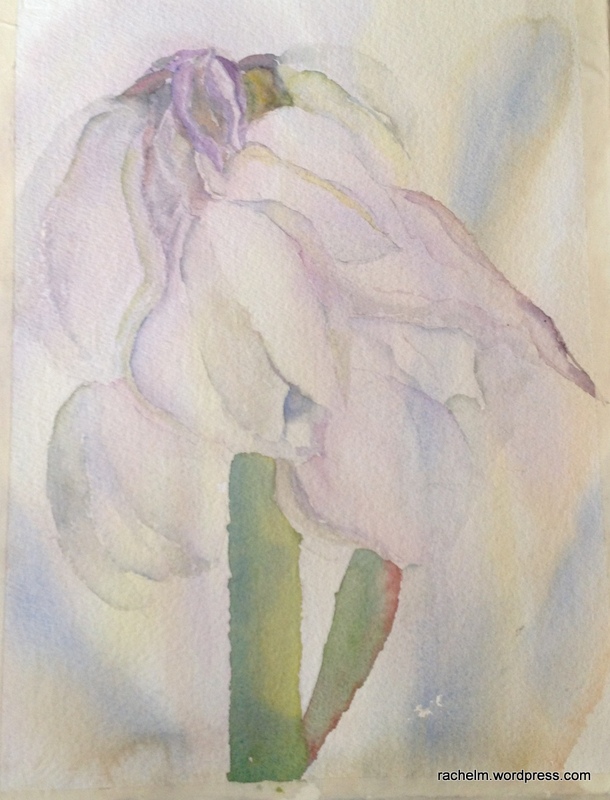 Following the process one would use to paint petals of a flower. Work on each and build it up to a certain level, what feels right, and then do another. So here’s the following stage. 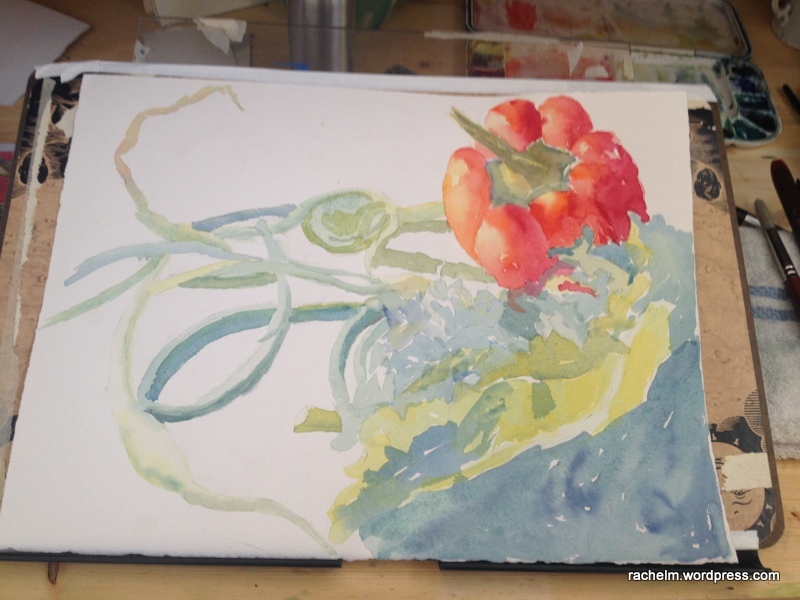 I worked on the swirl of the bud of the scape, to the left of the pepper. It needs a bit more refining but it’s more true to the spiral. I worked on various sections of the leaf. 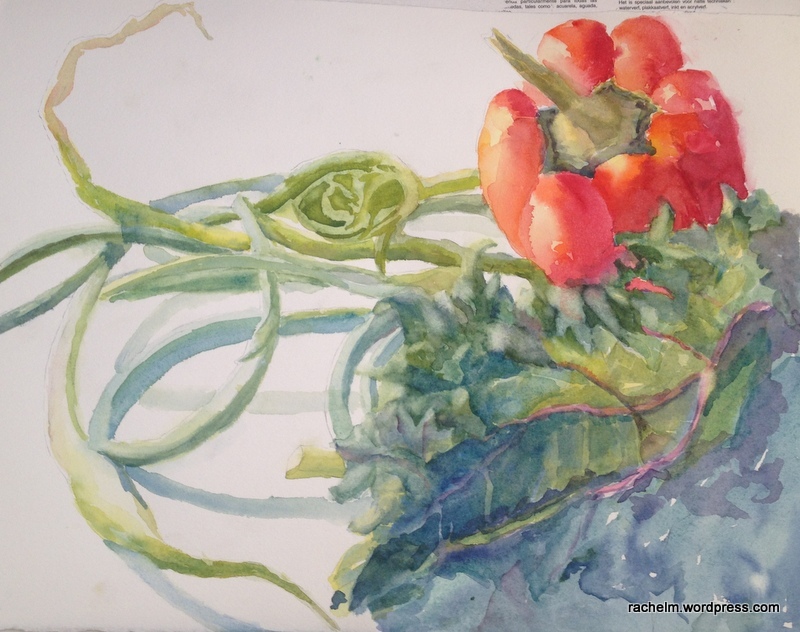 I knew I wanted the detail where it would catch your eye in the middle of the painting, near the red pepper — because red and green are complements so they “zing” against each other and that draws your eye. I knew I didn’t want a lot of detail, at least not now, in the darker, blue green shadows in the bottom right corner. With the advice and support of great friends in my painting group — you know who you are! — they counseled me on lifting out some lights, and going in later with the DARKS to give the leaf depth. 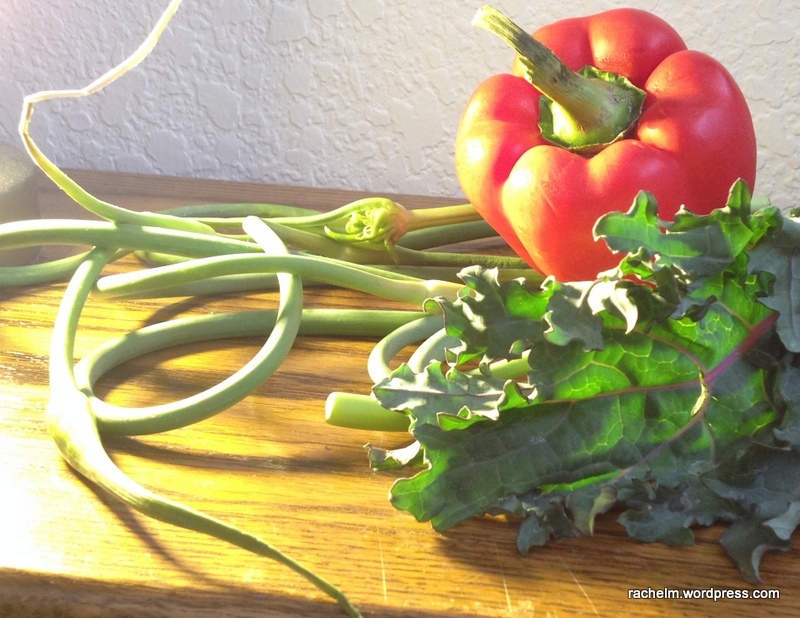 Right now it is all medium values, if you squint at it, the kale is all one value, no darks in it so spike it up! So that’s what’s coming next… stay tuned…. Thanks for stopping by. I’d love to hear from you — your thoughts, reactions, advice, critique! it’s all welcome. 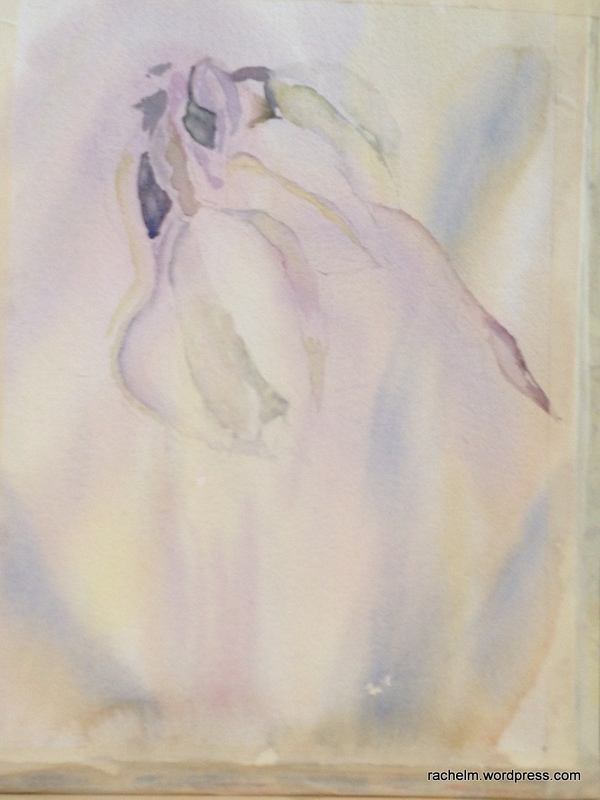 My friend Susie suggested that I might want to post a painting in stages so ya’ll could see the process as it develops. What a great idea! but I often don’t remember to snap the photo. But in this case I have. 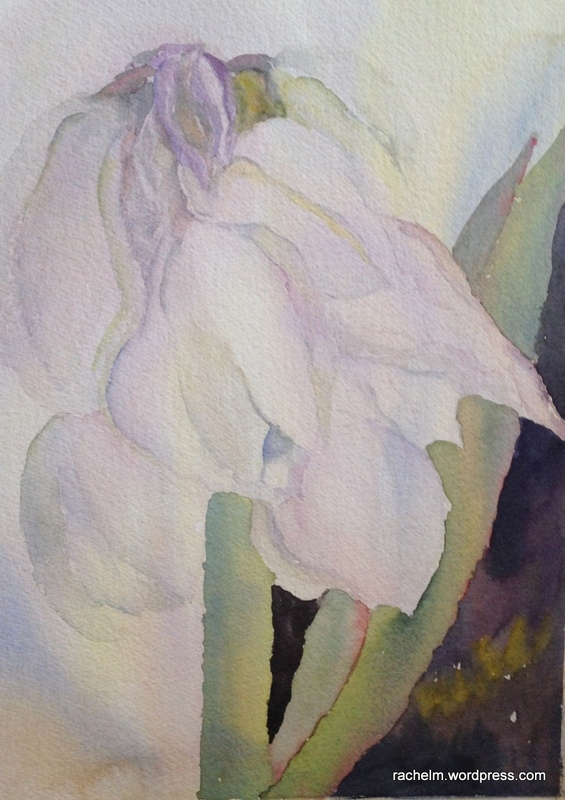 Here’s where the Yucca Bloom painting stands now. 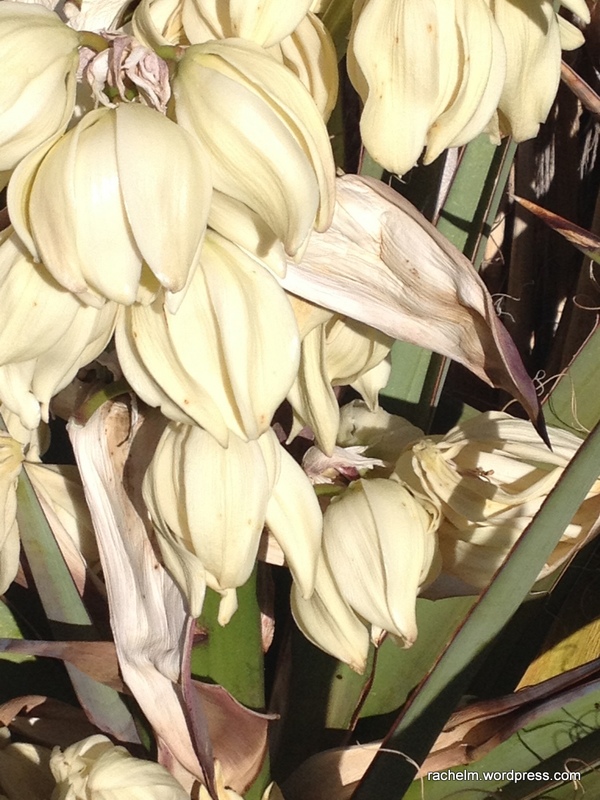 These are the photos I’ve taken on which the painting is loosely based. 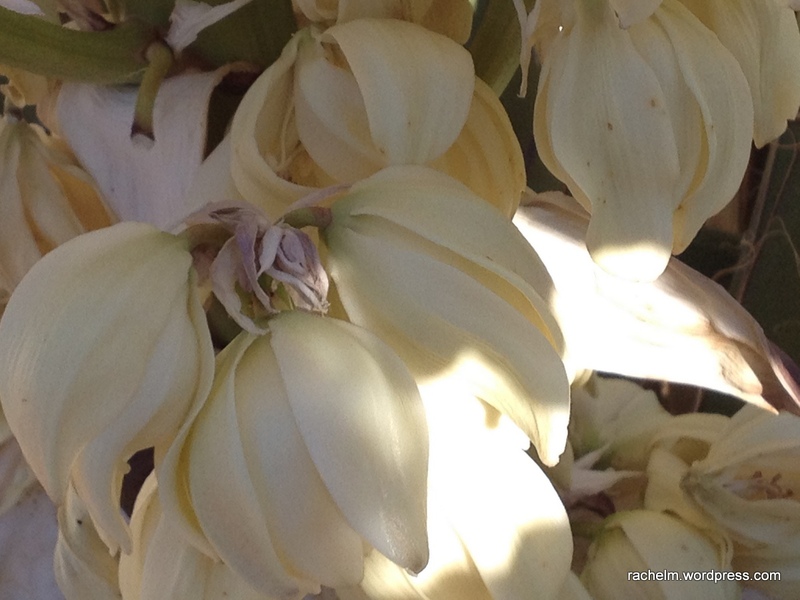 I like the closeup but not how washed out the sun on the blossoms made them. Scroll down to see the painting as it has developed thus far. 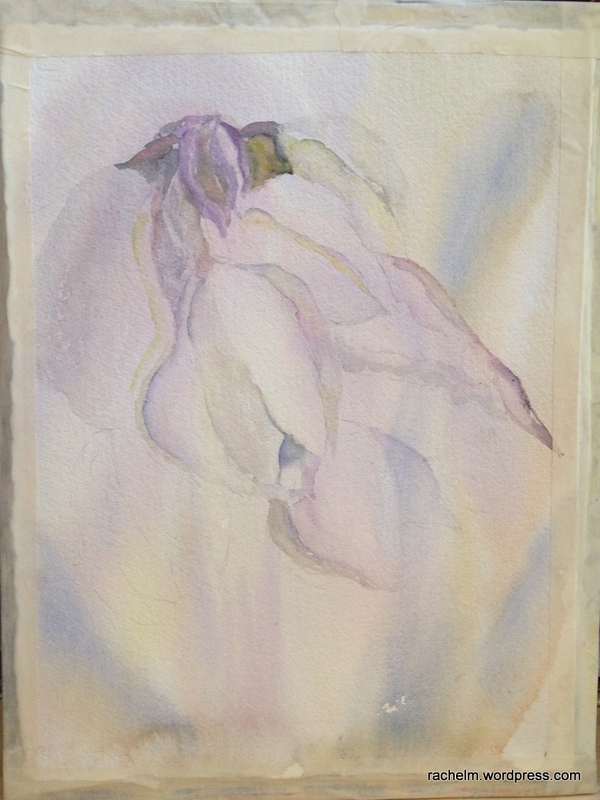 It’s a lot of fun to tease out the images by creating either hard lines by damping one side of a stroke of paint, or soft lines by painting wet in wet to form the bell shape of the blossom. Fun to create magic by making something 2D look 3D. I love it! No, these paintings were not done by my adolescents, but *they* are adolescents! 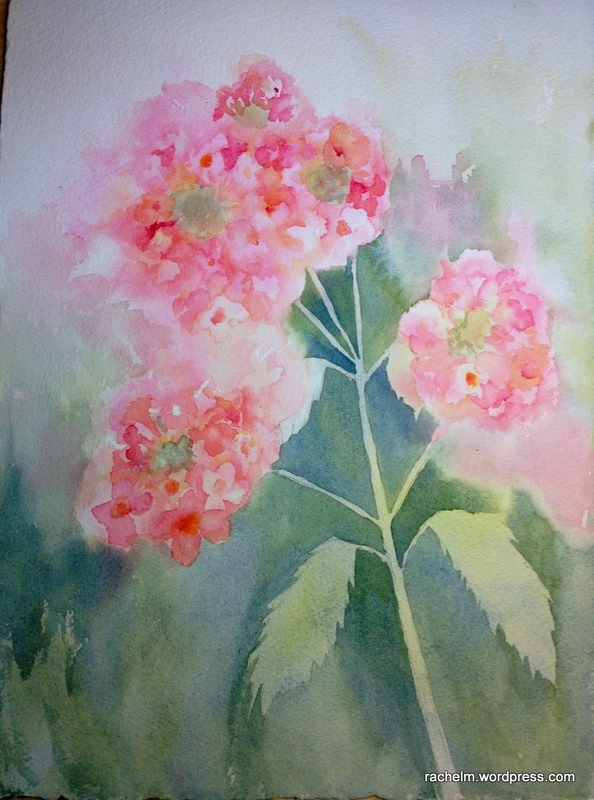 A new friend of mine said a workshop instructor said that all paintings go through this phase, a perhaps “ugly” phase, or not complete, where you as the artist are frustrated, worry it won’t come out well, or want to ditch the painting. I wish I could remember the artist’s name to credit him or her. In progress watercolor of wine bottles. I find this quite a comforting thought as I face my pile of started paintings from various recent classes and also my attempts at plein air painting (painting outdoors) last week. 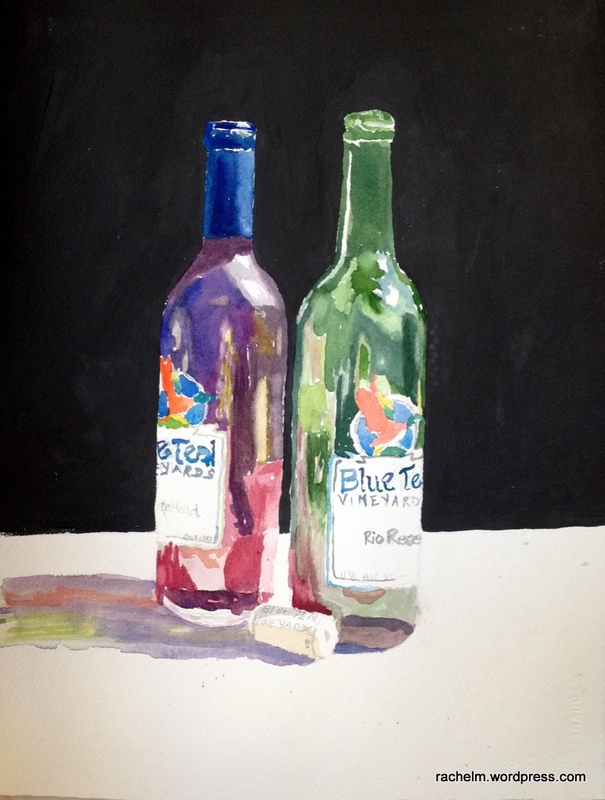 I think I will work on the wine bottle painting today when we meet to paint as a group. The plan is to mix a watery pigment puddle and carefully brush it over the existing bottles, one at a time, and selectively soften the edges of the reflections in the glass. I’ve put this off for two weeks, while we were on spring break with the kids, but now I will have to address it. It’s ONLY PAPER after all…I have to keep telling myself that. Stop and Rest. 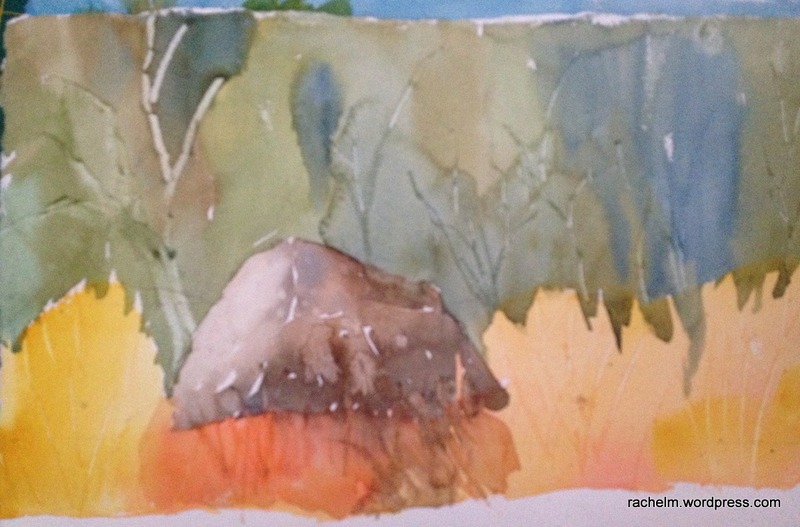 Forest scene with rock. Click image to view larger. Available. Here’s the second piece from Wednesday’s class on creating textures and fixing problem areas. 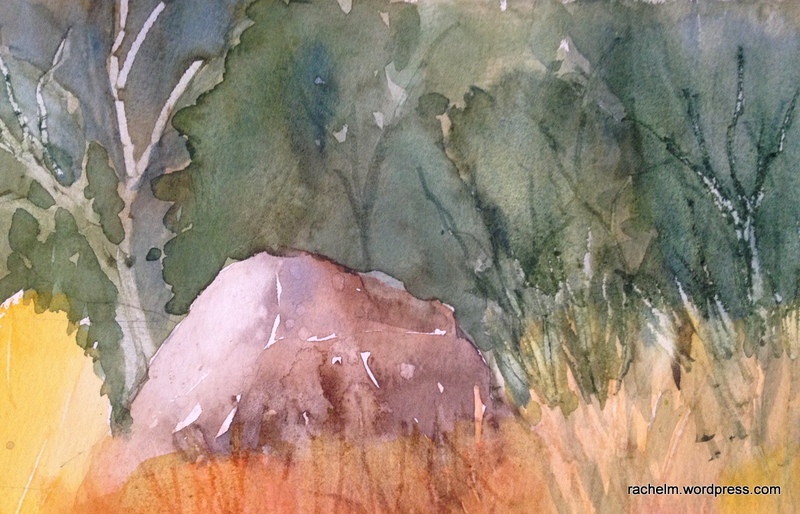 The instructions were a rock with grasses in front and lots of green behind, letting rich colors run in the background. I posted a picture below of what it looked like when I came home. The rock was floating, flat bottomed like some weird space hovering. I didn’t like the grasses. I can’t wrap my head around yet how to negatively paint the tops of grasses to get them to be thin blades, and I liked some colors in the mixing but the blues were too prominent and separated in the forest. How it looked after the class. it needed some help! So I did some scrubbing out of edges with a coarse hair cheaper acrylic brush that I cut down to make a stiff ridge, painted down over the tops of the grasses and then pulled up with a palette knife to get the grasses I wanted. added more color in the background, tried to create masses of bushes/trees with spattering of water, etc. While I wish that I had gotten this look earlier on so that it looked fresher and less worked, I’m glad I rescued it. I’d love to hear your thoughts! Thanks for visiting.